Let us go and be brilliant, my friend. Have a seat, and get comfortable; it’s gonna be a bumpy ride…. There were a pair of Star Trek episodes-one on the Next Generation, and one on Deep Space Nine-which featured devices from an ancient race known as the Iconians. Specifically, there were devices called Gateways that could teleport individuals across interstellar distances. 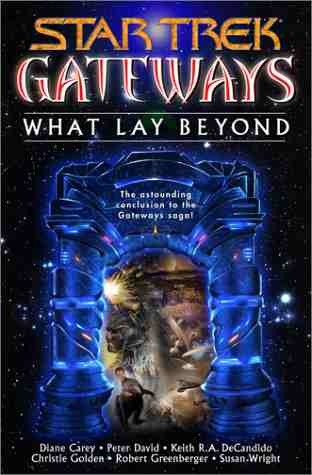 Both the Gateways, for various reasons, ended up as rubble by the end of those episodes. And now, they’ve inspired a massive Star Trek event, which crosses over all the franchises that have appeared in novelized form (except for Enterprise, for obvious reasons). 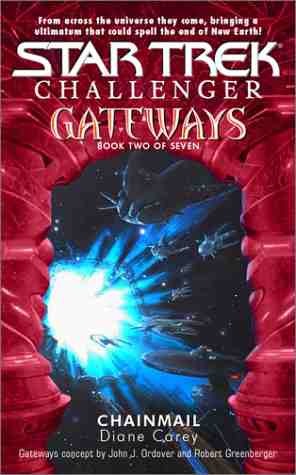 From the Original Series to the Next Generation, from Deep Space Nine to Voyager, and even the novel-only New Frontier and Challenger books-they all fall into the grand storyline called Gateways. So why am I reviewing this all at once, instead of as separate reviews? The main reason is that some of these books tie pretty close together. In fact, all of the latter-era books happen at roughly the same time. One of the best moments in these books is the conference between the leaders of various ships and stations; in the appropriate book, we see the same meeting under different points of view. While I moderately loathed the method, the event itself was a great scene. And a minor reason is because all of the books ended on a cliffhanger, with a number of major characters stepping into a Gateway to find “what lay beyond”. Cute, huh? So, I am presenting a series of mini-reviews. I could, I suppose, do full reviews on each, but then I’d be until next year getting these done, and that’s just not happening. This takes place in the last moments of one of the third season episodes, “That Which Survives”. One of the events of that show was the fact that the Enterprise had been flung a long, long, long way away. That serves as the jumping point for this series, as Kirk and company attempt to unravel the mystery of the race of the Kalandans, who apparently all died out. This seems to be disproved, however, by the arrival of a group of aliens masquerading as the Kalandans. The truth is that this race is the Petraw, and they seem to be more along the lines of pack rats than any technologically advanced society. So we get two groups of beings attempting to unlock the secret of the Gateway here. I rather liked the book on the strength of the fact that this didn’t involve saving any worlds or galaxies, but simply attempting to understand a dead race, and keeping the technology out of the wrong hands. This book is a follow up of the New Earth novels last year. Commander Nick Keller explores an alien ship that his first mate and bosun ran into and promptly disappeared into. Diane Carey has always written a good read, in my experience, and she manages to cover the presence of an alien race (or not so alien) on that ship and at their homeworld. At the same time, though, the political situation between Keller and the allied race of aliens known as the Blood Many takes a bit of a hit. Keller is so obviously unprepared for being a captain in the Starfleet mold, as he tries to hold together this alliance while staying loyal to his friends and shipmates and trying to figure out the mystery of the ship, its inhabitants, and its cargo. 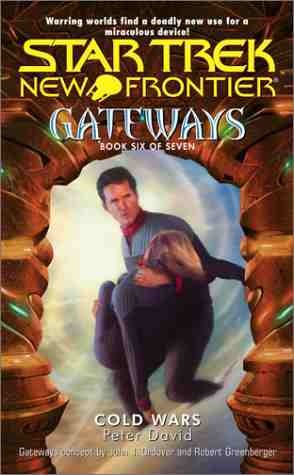 This was probably one of the stronger books in the Gateways series, and worth picking up for its story alone. 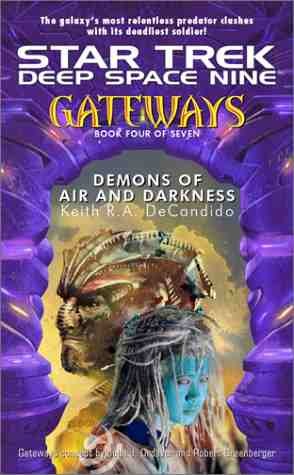 The first of three tightly-interwoven books, it sets up the situation in this era: the Iconians have seemingly returned, and they have offered their Gateways to the highest bidder. The bad news is that to prove their intentions, and to sweeten the pot, they’ve opened up all of their Gateways. This has caused a great deal of problems across Federation space, not to mention the Klingons, the Romulans, et cetera. The mission of the U. S. S. Enterprise and her crew is to muster up support for a coalition of governments to face the Iconians and to find out the truth behind this offer. The crew splits up for this, to cover more ground quickly. I anticipated this book more than any of the others (except for the next one), because the Iconians were of great interest to Jean Luc Picard, and I expected that anything about the Iconians was going to center on the good captain. All the same, it did feel a little flat to me; probably because there were just too many supporting characters flying around, and it was beginning to get difficult to keep track of them all. Still, it was a fairly solid book. Tying directly into the events of the previous book, and following the events of Section 31-Abyss, we find that there are three major plots rolling here. One, naturally, is the ongoing question of the Gateways, as none have been spotted anywhere near Bajor. 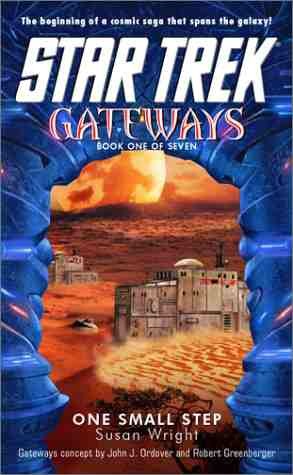 The second involves an effect of the Gateways, as one appears to be dumping large amounts of theta radiation to an inhabited world (fans of Voyager might have a pretty good clue here, although it’s explicitly pointed out in chapter one). The third involves Quark, and his negotiation with the Iconians on the behalf of the Orion crime syndicate. And through it all, a number of subplots from the DS9 series of novels continues to unfold, from Shar’s family problems, to Kira’s attempts to deal with her Attainted status. 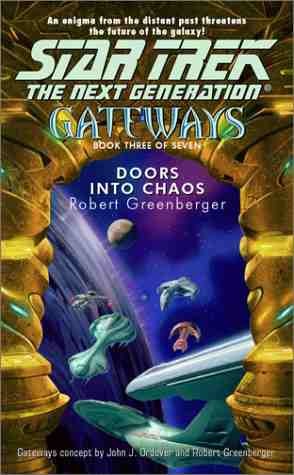 It’s close, but I’d have to say that this was the strongest of the Gateways books; in such a close race, I stick with my favorite series. But as I said, it was a real close call. Still locked in the Delta Quadrant, Captain Janeway suddenly finds herself trying to cross a region of space that is decidedly hostile, in a natural sense-asteriods, singularities, and red giant stars. Then things get really interesting, as a bunch of Gateways start opening all nearby Voyager, including a Hirogen vessel; not all of the vessels are really friendly, and Janeway has her hands full getting various starships to follow her across the “no man’s land” while trying to figure out how to get these people back to their own regions of space. While I considered this the weakest of the books, that doesn’t necessarily mean it was bad; a sort of murder mystery takes place during the book, as well as the discovery that one of the races involved are slave-lords. Still, there are aspects of the book that seemed outright silly to me. It does make sense with the final book in Gateways, but as a single novel…. 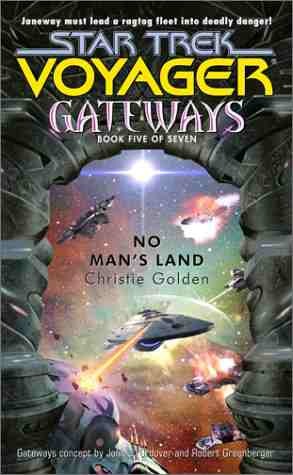 The Gateways are even a problem in Thallonian space, which requires not one, but two starships to investigate: the Trident, with Captain Shelby, and the Excalibur, with Captain Calhoun, her husband. This book kicks off as many of Peter David’s books-someone ends up getting killed. There are a pair of Gateways on two different worlds, brought by mysterious benefactors; the problem is that the inhabitants of these worlds hate each other, and were engaged in exterminating each other before the former Thallonian Empire separated them by locating them on different worlds. Starfleet’s goal is to investigate the Gateways in Thallonian space, and at the same time, stop the cycle of violence breaking out between these worlds. This was the other contender for the best of the bunch; while the cast of characters are beginning to be so many as to be unwieldy (two different starship crews! ), David still tells a good story within the framework of this mega-storyline, while still being able to tell a stand-alone tale. Fans of the original animated series get a special bonus as well in this book. I can’t really say too much about this book without spilling major beans. I can say that this is a collection of short stories that finish the cliffhangers for each novel, and each features the assorted captains, commander, and colonel of these books. Since I can’t go into details, I will at least let you all know my preferences, from least favorite to most (surprisingly, it doesn’t necessarily follow my opinions on the previous books!). Original Series, Challenger, New Frontier, Voyager, Deep Space Nine, and Next Generation. The reason for this order has a lot to do with how these stories followed up on the events that closed the novels. Some made more sense than others, and some I ranked higher because they made great sense. Final thoughts: as far as it goes, it was a pretty decent set of books. I am, however, extremely annoyed at the fact that I had to pick up a hardcover to finish the books. It doesn’t really affect me all that much, but than again, I tend to read all these books! For folks who only follow the Original Series, or Voyager for example, it might be a little upsetting to realize that to get the whole story, you need to buy a hardback (or wait a year until it hits paperback) to finish the story! I really wish they hadn’t done it that way, because I think it was done mostly as a marketing ploy. Just my opinion. But if you decide to pick up these books, with the understanding that they all conclude in What Lay Beyond, and with an intention to read all the books…well, Trek has had worse stories to work with.